Gabrielle’s journey into the world of glass has been an exciting compilation of positive experiences. From studying the medium of glass at Monash University Melbourne, to working alongside respected glass artist David Traub in his studio in Wanganui. Gabrielle gained invaluable hands-on knowledge as she trialled and experimented new techniques under the guidance of experts. Her work focuses on creating 3 dimensional movement in glass. The “movement” is created by manipulating the molten glass at temperatures over 930 C. A challenging process, but the results provide a “visual palette” of abstract design. The chosen elements are cut into different shapes and cold worked until the required high standard of finish has been achieved. 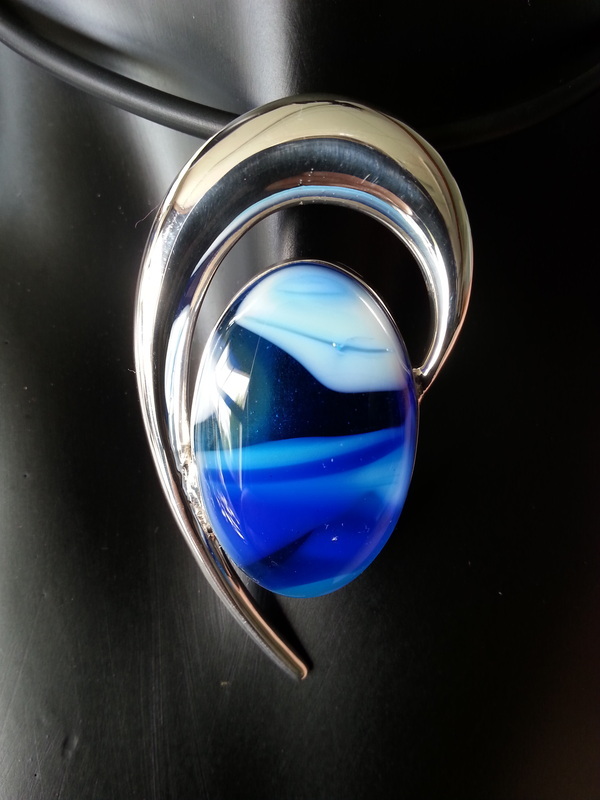 After kiln polishing each piece is set in sterling silver using a design that enhances all facets of the finished glass creation. Casual or formal these timeless handmade glass designs can be worn on a innumerable occasions and be treasured for years to come.